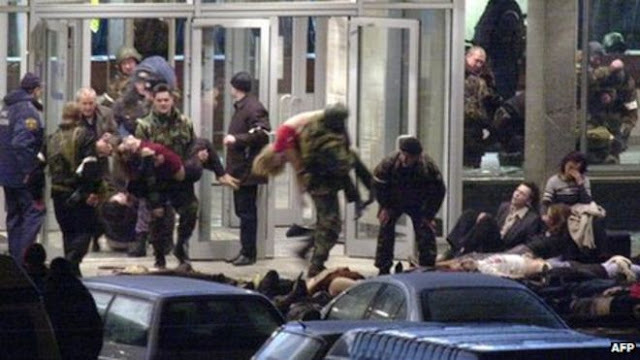 On October 23, 2002, about 50 Chechen rebels storm a Moscow theater, taking up to 700 people hostage during a sold-out performance of a popular musical. The second act of the musical “Nord Ost” was just beginning at the Moscow Ball-Bearing Plant’s Palace of Culture when an armed man walked onstage and fired a machine gun into the air. The terrorists—including a number of women with explosives strapped to their bodies—identified themselves as members of the Chechen Army. They had one demand: that Russian military forces begin an immediate and complete withdrawal from Chechnya, the war-torn region located north of the Caucasus Mountains.